A provocative and intimate exploration of modern parenthood by “a gutsy young third wave feminist” – The New York Times If parenting is making Americans unhappy, if it’s impossible to “have it all,” if people don’t have the economic, social, or political structures needed to support parenting, then why do it? And why are anxious new parents flocking to every Tiger Mother and Bébé-raiser for advice on how to raise kids? 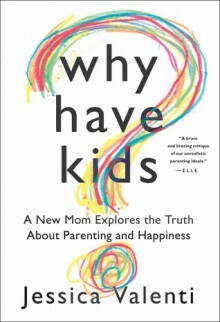 In Why Have Kids?, Valenti explores these controversial questions through on-the-ground reporting, startling new research, and her own unique experiences as a mom. She moves beyond the black and white “mommy wars” over natural parenting, discipline, and work-life balance to explore a more nuanced reality: one filled with ambivalence, joy, guilt, and exhaustion. A must read for parents as well as those considering starting a family, Why Have Kids? is an explosive addition to the conversation about modern parenthood. Recommended for anyone even remotely interested in parenting.